The following is a q&a between me and Steve Case. 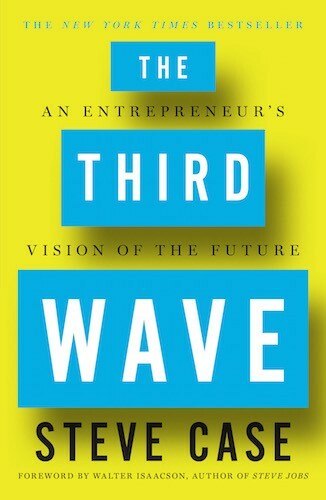 He has a new book out, The Third Wave: An Entrepreneur’s Vision of the Future. This book isn’t the first book with the title The Third Wave. You’re clearly playing homage to the futurist Alvin Toffler. Tell me about him, and why his book influenced you. I read Alvin Toffler’s The Third Wave when it came out in 1980 and I was a senior at Williams College. He imagined an electronic global village where people could access an array of services and information, participate in an interactive world, and build a community not based on geography but on common interests. In other words, he was predicting the commercialization of the Internet. I found his vision mesmerizing, and decided that was what I wanted to do. But when I graduated there were no Internet companies to go to, and there was no startup culture back then, either. So I worked couple of big companies — Procter & Gamble and then Pizza Hut — for a few years before I finally found a way to break into the online world in 1983. As we were building and growing AOL, the Toffler’s vision was never far from my mind. That idea of an interactive community was the essence of AOL. We believed that the killer app was going to be people, and that turned out to be the case. At our peak, about half of the Internet traffic in the U.S. went through AOL, and more than half of our usage was community related features — email, message boards, chat rooms, and instant messaging. Years later I had the opportunity to get to know the Alvin and also his wife Heidi. I also learned that she co-wrote the book, but never got the credit for it, because the publisher preferred just using Alvin’s name. I was proud to call my book The Third Wave, and kick it off with a homage to the Tofflers. And I was grateful they provided a blurb for my book. I can only hope that there’s somebody out there who finds my The Third Wave as inspirational! If there’s a “third” wave about to crest or break, there must have been a first or second? What were they? The First Wave was about building the Internet. It was creating the underlying infrastructure and bringing America (and the rest of the world) online. The iconic companies at the time — AOL. Cisco, Sun, Microsoft, Netscape and many others — were mostly focused on hardware, software, networks, servers, and so forth. They were building the core infrastructure, and the on ramps. And it was hard work. When we started AOL in 1985 only 3% of people were online, and they were online an hour per week. It typically cost $10 an hour to be connected, and it was a hassle; for example, you had to go to the peripheral section of a computer store to buy a modem, as connecting wasn’t viewed as core or essential by PC manufacturers. The Second Wave has been about building apps and services on top of the Internet. It got going around the turn of the century. Once everybody was online, the focus shifted on creating apps and services. The big winners in the Second Wave were companies like Facebook, Google, Twitter and Waze. And what’s the “third” wave? This Third Wave has just begun. Now the focus will shift to integrating the Internet seamlessly and pervasively throughout our lives. Entrepreneurs will change how we work, how we learn, how we stay healthy, even how we eat. These things have changed somewhat in the First and Second Waves, but they’ll change a lot more in the Third. But success will require a new playbook, and that’s why I wrote this book. Some aspects that were important in the Second Wave — such as great people and compelling platforms — will remain important, but some new dynamics will kick in. Partnerships will be more important, as disruption will increasing require engaging, not ignoring, incumbents. Policy will become more important, because many of these sectors are regulated. And frankly perseverance will become more important too, as overnight successes will be rarer. The impact can be revolutionary, but the approach to achieve that impact will sometimes be more evolutionary. Is Silicon Valley the most likely point of impact for “third wave,” or do you see it happening elsewhere? Silicon Valley will remain the epicenter of innovation. The ecosystem there is tremendously strong, with talent, capital and fearlessness working together to drive disruptive change. But in the Third Wave, I think you’ll see the acceleration of regional entrepreneurship, what I refer to in the book as the Rise Of The Rest. I spend a lot of time on the road on Rise of the Rest bus tours where I visit emerging innovation ecosystems across the U.S. and meet with thousands with entrepreneurs. There is an unbelievable potential in places like Buffalo, New Orleans, Charleston, Nashville, Madison, and numerous dozens of other cities. And as you have written, the lean startup movement has had a dramatic impact on innovation. The ability to leverage outside resources enables innovation to come from smaller, and sometimes dispersed, teams. And if the teams are smaller, they can increasingly be anywhere. Some will choose to be in Silicon Valley, but some will also choose to be elsewhere. And as crowdfunding takes hold and it is easier to raise money, the need to be in a place where the venture capitalists sit — Silicon Valley, New York City, or Boston — will be reduced. Lastly, some of the biggest companies in the country are in the middle of the country. Monsanto which is big in agtech is in St Louis. United Health which is the largest health insurer is in Minneapolis. Under Armour which is leading in healthtech is in Baltimore. The list goes on and on. And as partnerships become more important, being close to some of these companies, and leveraging some of the talent coming out of these companies, will become more commonplace. How much of the third wave involves the technology industry, and how much of it involves industries such as agriculture, or manufacturing, or healthcare? As I noted, entrepreneurs in the Third Wave will finally have at their disposal the necessary tools to revolutionize sectors like health, education, financial services, and even food — if they get the playbook right. In the Third Wave technology itself will become horizontal and touch all industries (indeed just as we no longer say “electricity-enabled” we will no longer say “internet-enabled”). So whether we’re talking about vertical agriculture, advanced manufacturing, or precision medicine, the “Internet Of Everything” will take hold. Most people know you as the co-founder of AOL, but that was far from your first venture, and it was far from your last. What did you iterate at AOL that seems quaint know? And what were you doing at AOL that was possibly too far ahead of its time? Ten years after we started AOL I was interviewed on PBS and asked “so why would we actual need this (the internet)?” It took some time to convince the public, even after ten years of working at it! When we started AOL, it was still illegal for consumers and businesses to connect to the Internet. There was a lot of blocking and tackling to get going and get traction. It was a slog. Indeed when we went public in 1992 we had just 184,000 customers, and we’d been at it for seven years. But seven years later we had more than 20 million! Back then our focus was what I called the 3 Cs: community, context, and content. We believed they all would be important, but felt passionately than community would be the most important. We used to say that the “killer app” was people. Thankfully, that turned out to be the case! But some things we got wrong. We created the first graphical online multi-player game in 1986, in partnership with Lucasfilm. But it was designed for the Commodore 64 computer and 300 baud modems, so it was pretty rudimentary. We acquired the first search engine, called Webcrawler, but missed the opportunity to turn it into Google. We tried to acquire Yahoo when it had just two employees — the cofounders Jerry Yang and David Filo. We offered $2 million, and they turned it down, and chose to raise venture capital instead. Whoops! You spend a lot of time talking with and counseling entrepreneurs cross the country. What’s the advice you hear yourself giving again and again? To me it’s about the people. Entrepreneurship is a team sport, and you have to have the right team. And you have to focus on where the puck is going, not where it is. Which is why I decided to write this book. The Third Wave will be different and require a different mindset and a different playbook. Partnerships will be much more important. There’s an African proverb that will define the Third Wave: “if you want to go quickly, go alone, if you want to go far, go together.” Entrepreneurs can change the world in big ways in the Third Wave, but they will have to go together. And they’ll have to engage constructively with governments, as policy will be more important. And they’ll have to persevere, as some of these revolutions will take time.